One of our dogs is deaf. (hearing impaired, if you want – I believe he doesn’t care). He is a shelter dog and actually the one that “listens” best. Because of his lack of hearing, he is very attentive and receptive to hand signs and facial expressions. It’s not actually causing any problems. We do not need to use words. 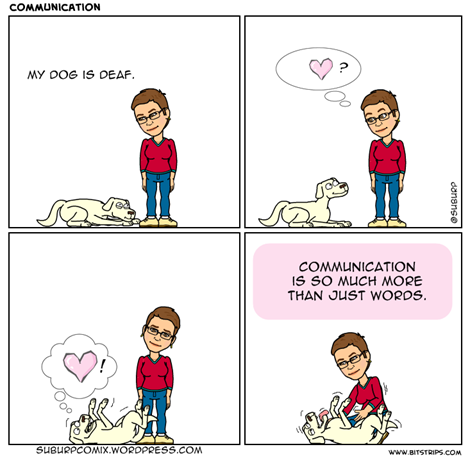 This entry was posted in autism, general and tagged asperger's, autism, blind, comic, deaf, dogs, hearing impaired, special needs on September 28, 2013 by starfish.